Last two weeks, we had a short visit to Taiwan Buddhist Tzu-Chi Foundation Malaysia (KL & Selangor Branch). 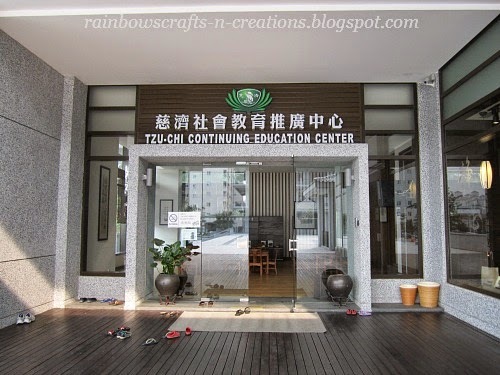 Taiwan Buddhist Tzu-Chi Foundation Malaysia (KL & Selangor Branch) is located along Jalan Kepong, KL. According to one of the volunteers there, the KL Jing-Si Hall was designed as a green and eco-friendly building due to global warming. She also said the hall was specially designed in a way that it could get natural air and direct sunlight to brighten up internal space of the building in order to minimise the usage of air-conditioners and save electricity. The volunteers there were so nice. A nice volunteer brought us to visit the whole building and patiently explained to us the histories and stories of Tzu-Chi. There were many huge posters hanging on the wall along the ramp walkway that led to the other floor. The posters there gave us the information about the histories and the missions of charity of Tzu-Chi. I was interested in the histories of "The founding of Tzu-Chi" and "The spirit of the Bamboo Bank Era". According to one of the posters there, in 1966, while Master Cheng Yen was visiting a patient at a local clinic, she saw a pool of blood on the floor. Master Cheng Yen was told that the blood was from an indigenous woman suffering from labour complications and could not afford the deposits. 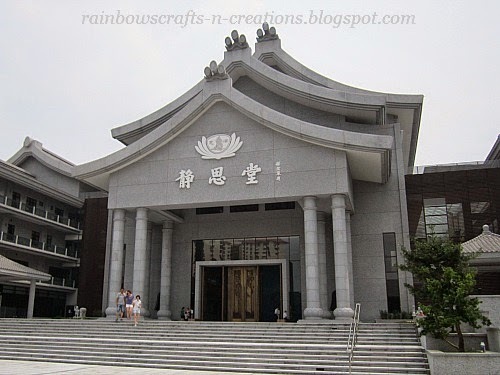 The overwhelming sorrow prompted Master Cheng Yen to make a great vow and establish Tzu-Chi in Hualien, Taiwan. Another huge poster mentioned that Master Cheng Yen established Tzu-Chi with the concept of self-support, diligence and frugality. It began with Master Cheng Yen and five disciples, each producing an extra pair of hand sewn baby shoes every day; and thirty housewives each saving NT$0.50 (about RM0.05) from their grocery money in a bamboo bank daily. This was the charity fund to help the needy. This is how the spirit of the "Bamboo Bank Era" began. 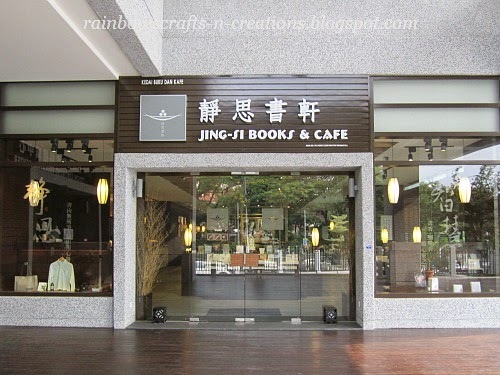 Beside the Jing-Si Hall was the Jing-Si Books & Cafe. The interior design was modern and the decorations were beautiful. We enjoyed sitting there and having a cup of coffee, what a comfortable feeling!